VietNamNet Bridge - Miners have given back their mines and left Ha Giang province after causing serious consequences to the local environment, but the environmental protection fees were not enough to compensate for the pollution local people are suffering. According to the Ha Giang Department of Agriculture and Rural Development, in 2011-2015, the local authorities used 1,394 hectares of production forestland, 525 hectares of protective forests and 39 hectares of special-use forest for the purpose of mineral exploitation and power generation. According to the director of the Ha Giang Department of Natural Resources and the Environment Hoang Van Nhu, most of the mineral mines are located on forestland that the local authorities have changed for purposes of use. The mining has made the locals’ lives upset. As the open-cast mine is on a mountainside, when it rains, the water flows down the stream, burying people’s rice fields. Local people dislike mineral exploitation, because the activity doesn’t bring economic benefits to them, but instead pollution. But they still have to give forestland to investors for the sake of local economic development. However, the problem is that mining has been ineffective in recent years. Miners complain about losses, cannot pay tax and have given the mines back to the state. 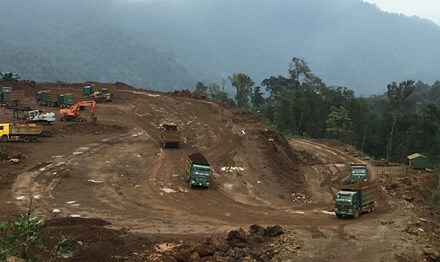 According to deputy chair of Minh Son commune People’s Committee Hoang Van Thuan, the mining has made the forests disappear, causing pollution and damage to roads. “We just finished the building of the roads in 2011, and the trucks of the miners damaged them when they came there in 2012 to exploit minerals,” Thuan said about the exploitation of the Sang Than iron mine. The exploitation site, 9.8 hectares, was special-use forest, put under the management of the Du Gia SUF Management Board. “Minh Son commune has received VND200 million in tax and fees from the Sang Than mining, a small amount of money which is not enough to offset environmental consequences,” he said. The lead and zinc exploitation site is located next to the Sang Than iron mine. A tottery waste sludge reservoir was lying on the hill slope, with no embankment. Local people complain that the waste pours from the reservoir on rainy days to the stream. Fish and shrimp have died because of the chemicals in the sludge. Vu Manh Hung, deputy director of the Ha Giang Taxation Agency, commented that miners are given many investment incentives, but don’t bring high economic benefits.